​The quilting frame kit is great. My husband made me a 6 foot tabletop frame that fits in our guest bedroom. I mostly quilt laptop quilts and smaller. He was able to follow your directions and pictures. We used 1 inch angle iron, then noticed the platform used 3/4 inch, but it works great anyway. Just wanted to say thanks soooo much for your help & the plans. I love it!!!! Get your machine quilting frame plans here! Just wanted to show your wonderful frame. My husband went to milk cows and I started construction. 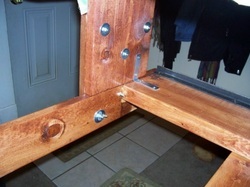 I had table all set up and when he came home he finished helping me drill holes in angle iron. Now i'm just waiting for my conduit to get welded. Maybe on a few days it will be complete. I would sugguest that if anyone wants to save time to order the master kit! I spent $15 on angle iron, $60 on conduit and $30 on wood. So a little more expense but saved alot on wood cutting! Thank you so much! Thanks again Richard for your hard work in designing this for us ladies and gents out there that want to machine quilt for less $$$. I had $190.00 into it not counting what I paid our friend to build it. All parts were purchased at Lowe's. You will note I took pictures of the carriage bolts, standard bolts and nuts I installed to make taking the frame down quicker and easier. I can take it down in under 10 minutes and have it stowed behind my couch. Thanks so much for your help and advise. 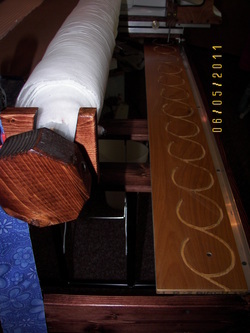 Hi Richard, Last fall my guy, Pete, built me a 12 foot quilting frame from your plans. Attached are photos of the frame, which is working out very well. Pete made a couple of modifications as time went on. I have been practicing quilting. So far, I have completed six quilts using the frame. Thanks so much for the plans. "Norene Bult" Frame Built by: Norene! I purchased the parts for the side boards and carriage from Mr. Richard Miller to make my frame. I got the rest from the lumberyard, etc. The neighbor cut my boards for me as my husband is ill and can't do much. He did help me line up my table the best he could and gave advice from his chair. The rest I put together and stained myself. All in all I spent $250.00. I have finished one quilt and started another and I just love having my new frame. Thanks to Richard and all his help! Hello Richard ! Here's some pictures of my completed frame!! I think we did you proud! even if I do say so myself. Dave did a great job in constucting it! from your plans even though he knows absolutely nothing about quilting, quilt frames, or sewing in general. My wife has wanted a quilting machine for years but we've never quite had the finances for one. Even the Gracie's were out of our reach. What a great surprise it was to see your plans on Ebay. I finished the machine on Christmas Eve and gave it to her on Christmas morning. It was awesome! Your plans were spot on and easy to do. The material list was so perfect I only made one trip to Lowes. Thanks and I'll echo God bless you! I recently purchased your quilt frame instructions and, last week, my husband completed my new frame. My husband did not fully understand what he was building or how it was supposed to work, but your instructions were very clear. Due to space constraints, we opted for an 8-foot table and my husband chose mahogany which turned out beautiful. We also decided to attach the roller support structure with carriage bolts and wing nuts to make it easier to dismantle the frame for storage when necessary. In addition, we had to go with 1-inch conduit for the rollers as the size listed in your instructions was not available at our local Home Depot. (Supplies are sometimes not a readily available here in Hawaii, so we have to improvise.) Anyway, I wanted to thank you for making your quilt frame plans available. I look forward to many years of enjoyment using this frame. I just wanted you to know that I am half-way done with a quilt, using my new frame. I am in heaven!!!! My husband built the frame in one day. It was the easiest pattern to follow. Your directions and pictures were awesome. It is like a fever. I can't stay away from it. Thanks for the great pattern and thanks for the great husband that made it for me. I finally finished the table,it was a good experience. I really appreciate you for putting together this manual for a quilt frame. I very much wanted one but I'm unable to afford a nice quilt frame just now for my machine. I'm a father of seven so if it's not a must I probably wont purchase it. Anyway i can now use this frame I'm sure it will save me loads of time it's already saved me money!. My wife has now also started to quilt with me so its fastly becoming our favorite past time. I thought i loved piecing quilts together I'm finding quilting is just as fun. Thank you again!!!! I could say so much more but please except my humble thank you!!! God Bless you!!!!! "It's been fun building the frame - the directions are great. I'm an old back stage person from high school and college and learned to use tools way back when and have been able to put that knowledge to good use. My DH says I'm the only woman he has ever known who wanted a compound mitre saw for Valentines day! If I need help later, I hope I can write to you and ask! Again, my thanks, Sue"